Discussion in 'Classic Muppets' started by mikealan, Jun 18, 2003. When I tried to watch the "two little dolls" film on Sesame Street, my mom ALWAYS want me to write down her name on my biology test for school. And the classic clip I hate right now was the animated/live-action skit of the letter D, because of the species of dogs like dalmations and dioxins! 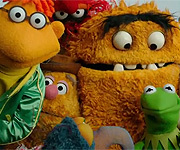 The Muppets that ALWAYS annoy me are Kermit the Frog, Miss Piggy, Gonzo, Rizzo, Robin, Dr. Teeth, Floyd, Zoot, Statler & Waldorf and sometimes Scooter! The Muppets that did NOT bother me are Dr. Bunsen Honeydew, Beaker, Animal and the Swedish Chef! The Sesame Street Muppets that ALWAYS annoy me are Elmo, Big Bird and Sam the Machine! The Sesame Street Muppets that did NOT bother me are Ernie & Bert, Oscar, the Cookie Monster, Harvey Kneeslapper, Herbert Birdsfoot, Little Bird, Lefty and Sherlock Hemlock! I HATE THE MUPPETS AND SESAME STREET!!!! DO YOU? Chill out!!! I'm having a difficult time understanding what your even trying to say. Cohesive sentances and complete thoughts would help!!! If you 'hate the Muppets', why are you here? This forum is about Classic Muppet characters. If you don't like them, fine, simply don't post. 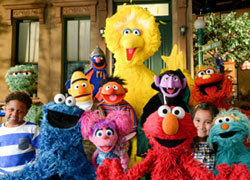 If you prefer some of the Sesame Steet characters, then post what you do like about them in the Sesame Street Forum. But please, leave your negativity out of this forum since you seem to be 'in a bad mood'!!! Sometimes you confuse me. You already started a thread about this. How many more threads will you make about this happening? Anyways, how often do they show it that you coincidentally have a science test for school and your mom is making you write her name on it? Here's another funny thread! I tell ya'! I giggle so much when I read this thread! Well, I didn't mean to hurt your feelings, guys. I'm sorry. But some of the characters do annoy me when I'm in a bad mood! You know who annoys me when I'm in a bad mood? Mikealan! Whats the reason you are still here. You pretend to be the biggest SS-fan ever, and you hate Big Bird??? How could the Muppets annoy anyone? How could someone hate them? Even when you are in a bad mood. I thought this website and forums in it are for people who like the Muppets and Sesame Street and the other things by Jim Henson!? I doubt if you're going to fire me. Guy? Guy Smiley? I think he's a game show host. Well, I still can't figure out why people think Elmo is annoying. Just like you said, how? I want to say a canon, but that should be "fire out of". You need a better life then getting mad at the muppets. Don't watch thme if your in a bad mood. Anyways anytime I'm in a bad mood I watch the muppets it gets me out of the bad mood. So don't watch the muppets and you won't get mad. Hey I got an great idea for your sorows. Don't watch them at all. Ok. Take it about five mintues after you leave this site. Ok bye. This has got to be one of the strangest threads I've ever seen on this board. If you have a problem with "Kermit the Frog, Miss Piggy, Gonzo, Rizzo, Robin, Dr. Teeth, Floyd, Zoot, Statler & Waldorf and sometimes Scooter" what is the point of even watching the show? Most of those characters make up the core cast of the Muppet Show! That would mean every time you watched the show you'd get ****** off. I just don't get it. That was a post to a thread you can't believe people are still posting to. Does that make sense to you? Beau I know there's already a thread for your avatar but I don't feel like moving (The mouse anyway) so I just want to say your avatar is Beautiful Regardless of what people might think. Pepe the, first Zack, then you and now me are doing this Shrimp... I mean King Prawn!!!!!!!!!!!!!!!!!!!!!! No, but I have 17 cents.